The Tinapa Shopping Centre is the biggest shopping mall in Nigeria. 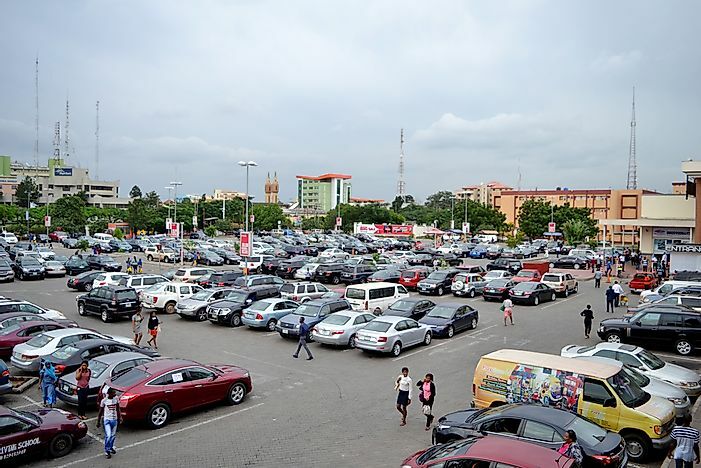 A full parking lot at Ikeja City Mall, one of the largest shopping malls in Nigeria. Editorial credit: Omnivisuals / Shutterstock.com. Nigeria has a Gross Domestic Product of $405 billion, making it the largest economy in Africa. Consumerism in the country has been on a growing trend in recent years. To make the most of this trend, companies in the real estate sector have spent millions of dollars to construct huge shopping malls. As a result, the country is home to some of the largest shopping malls in the continent, many with facilities rivaling those in major shopping malls in Europe, the Middle East, and North America. The five largest malls in Nigeria exceed 0.25 million square feet in total retail space, and the largest of them, the Tinapa Shopping Resort has a retail space of 0.861 million square feet. Tinapa Shopping Resort is a huge mall, whose total retail area covers a total of over 861,000 square feet, making it Nigeria’s largest shopping mall, and among the largest in Africa. The shopping mall is situated in the Tinapa Free Zone, near the city of Calabar and is owned by the Tinapa Business Resort Limited, a local company. Development of the mall is the brainchild of Cross River State governor, Donald Duke, who oversaw its construction and subsequent opening on April 2nd, 2007. The design and construction of the shopping mall were carried out by an international team of experts drawn from Nigeria, South Africa, and Germany. The mall aimed at opening up the Cross River State and has brought employment opportunities to hundreds of people. Shoppers who visit the shopping mall get to park the cars in the large parking area that has a capacity of 4,000 cars. Nigeria’s Enugu State is home to one of the country’s largest shopping mall, the Polo Park Mall which has a total retail area of 0.242 million square feet. The mall is situated in the city of Enugu. The mall is owned by Broll Properties Services Limited, but its development was carried out by the Persianas Group. The Polo Park Mall is so huge, and while other malls have one anchor tenant, the Polo Park Mall has six anchor tenants. The shopping mall was the first in Enugu State to be recognized as a “first world-class shopping mall”, and is among a few in the country to have the distinction. The building that houses the shopping mall is made up of three floors. The Enugu state government oversaw the opening of the shopping mall in September 2011. Another large shopping mall in the country is the Ikeja City Mall. Like its name suggests, the mall is situated in the Ikeja region of Lagon State. The mall is among Nigeria’s largest shopping malls, with a total retail area of about quarter of a million square feet sitting on a building made up of two floors. Shoprite and Silverbird are the two anchor tenants of this large shopping mall. Broll Property Services Limited, a leading real estate company in the country is the owner of the shopping mall. The firm was also in charge of the development of the mall, with its construction starting in 2010.